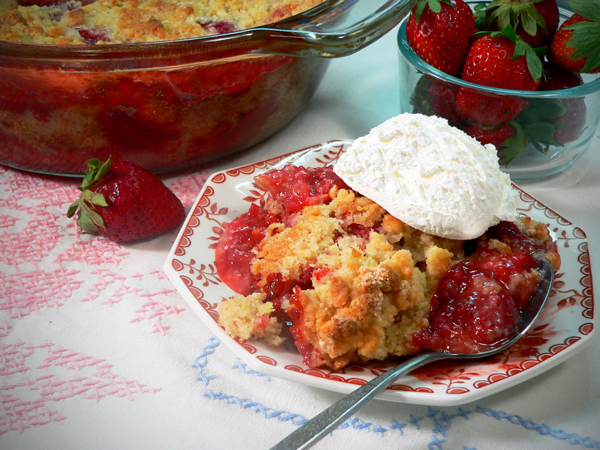 Don’t let Strawberry Season slip you by without trying this quick and easy Strawberry Cobbler Recipe. All you need are some fresh Strawberries and a few ingredients you will most likely already have in your kitchen. It’s crumbly crust topping turns out sweet and crunchy and isn’t one of those all bread type of crusts. It’s a great way to cook up a quick and simple dessert all the family will enjoy. Strawberry season came a little early this year in the South due to the warm weather we’ve had. There were a couple of nights though that were of concern because it got back down to almost freezing. We all prayed for the best in hopes the frost wouldn’t hurt the plants that were already bearing green berries. Thankfully, even though we came close, the berries made it and are in plentiful supply all around us. One of our sponsors on the radio program I host sells Strawberries and I kept waiting for them to start advertising their berries again for this year. They started just a week or so ago and I’ve been trying to figure out which recipes I should work on first. I’ve waited a week or s0 to get some sweeter berries and I wasn’t disappointed on Saturday when I finally picked up my first bucket. Yes, FIRST bucket, I’ll be going back over the next couple of weeks for more….there’s just so many things you can do with them. It was about 3pm on Saturday afternoon when I stopped in at Harrington Farms. 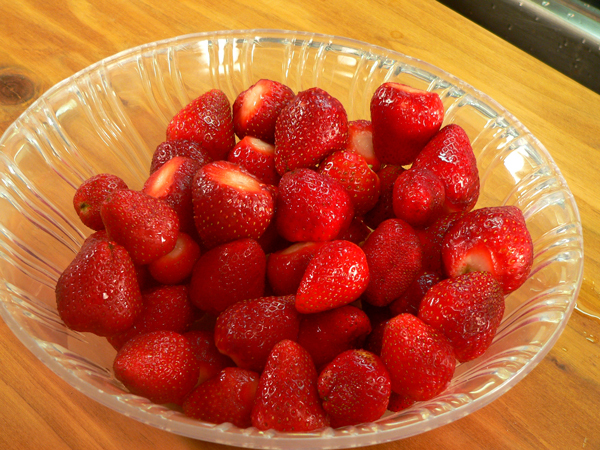 We have several large farms in our area that sell Strawberries already picked or will let you pick-your-own. My days of picking my own are probably gone forever. The old legs and knees just can’t take that kind of thing any longer. Berries grow too close to the ground for me it seems. Tammy was behind the counter as I entered the small building. A lady had entered just in front of me and we both walked over to look at the already picked Strawberries on the counter. I did notice a couple of folks out in the field that were picking their own as I parked my car. Tammy and I talked about making jams as she rung up my purchase. She also told me about a Strawberry Pie type of recipe that I’m eager to give a try. I told her about Taste of Southern so I hope she’ll be willing to share the recipe with us soon. With that, I grabbed my bucket and headed for the car. I was headed out for supper with some friends and then to the auction. I knew it would be Sunday afternoon before I got to do anything with my Strawberries. Fortunately, I sat them in the front floorboard….out of arms reach….as I drove away. Otherwise, a lot of them would have never made it home. 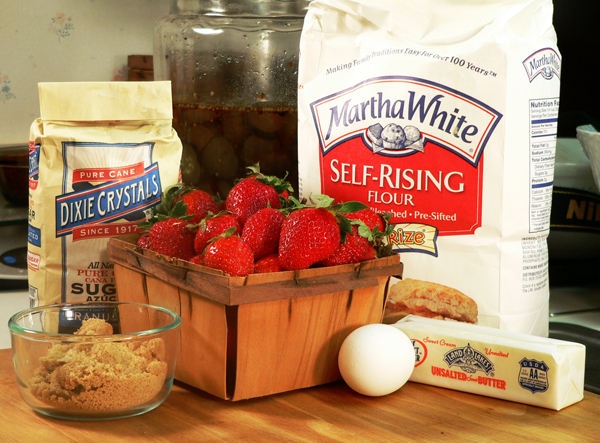 Strawberry Cobbler Recipe: You’ll need these ingredients. How long has it been since you’ve seen one of those little wooden crates? Years back, all your berries, peaches, etc., would come in those type of crates. After that, they started using those green plastic crates with the little holes all in them. From there, you started seeing the green Styrofoam type of box and most recently, you’ll find the clear plastic boxes being used these days in most grocery stores. Roadside stands and area farmers selling Strawberries are using cardboard flats or white plastic buckets for the most part to transport their berries. I picked up about 6 of these little wooden baskets at our local auction recently. At the auction is where you’ll generally find me on Friday and Saturday nights. When these came up for auction, I knew I had to have them. In my mind’s eye, I could already see them filled with delicious fresh Strawberries in one of my recipes listed here on Taste of Southern. Of course, you can still buy them brand new today on EBay or from various suppliers around the country. I never considered that though as I liked the “vintage” look these used ones had. Back when I was a youngster, my dad operated a roadside fruit stand. We sold all types of produce straight from our gardens. We had one garden right behind our house, one behind our neighbors house and one a couple of blocks away at another friends house. I guess I got off pretty easy with it though. Daddy worked the gardens and left me home to run the fruit stand. I could sit in the living room with the front door open and see when a car stopped or when someone just walked up to the stand. We didn’t have air conditioning so the front door was open, covered with a wooden screen door. It was pretty neat because I got to watch all my favorite cartoon shows and programs until someone stopped out front. I remember we sold tomatoes from our garden at 3lbs for 1.00 most all the time. We had squash, green beans, peas, cucumbers and other such items. Daddy would buy some other things that we sold as well, like banana’s, apples, watermelons and grocery store bread. Yep, the bread man would stop and restock our little fruit stand just like he did the grocery store that was sort of across the street. We used a good deal of those little wooden type baskets back then. It had been a long time since I’d seen any so as I said, I knew I pretty much had to have them. I think I ended up paying about 3.00 for all of them. Funny how the little things like that can bring back so many memories. How about you? What sparks a memory from your childhood? Are you ready for some Strawberry Cobbler? Alright then…..Let’s Get Cooking! I like to remove the “hull” or top from the Strawberries first. You can purchase a little tool made specifically for the job for about a dollar. But guess what…I don’t have one….go figure. Instead, I just use a paring knife and cut the green tops, or hulls as they are called, away from the berry. Normally I just dump all the berries in my sink, cut the tops off and place the Strawberries in a colander. You’ll want to toss out any bruised or damaged berries all together. If you find a berry with a bad spot, you can usually just cut that away and use the remaining part of the berry. Strawberries will ripen quickly once picked. Unfortunately though, they don’t get any sweeter as they ripen. Also, don’t wash them until just before you’re ready to eat them fresh or use them in your favorite recipe. 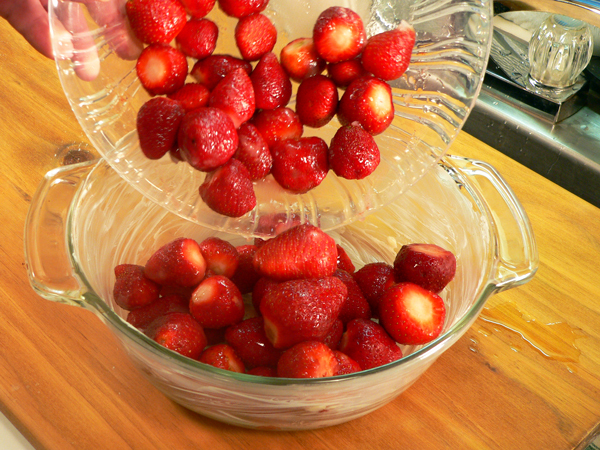 You’ll need to do this for all of your Strawberries. 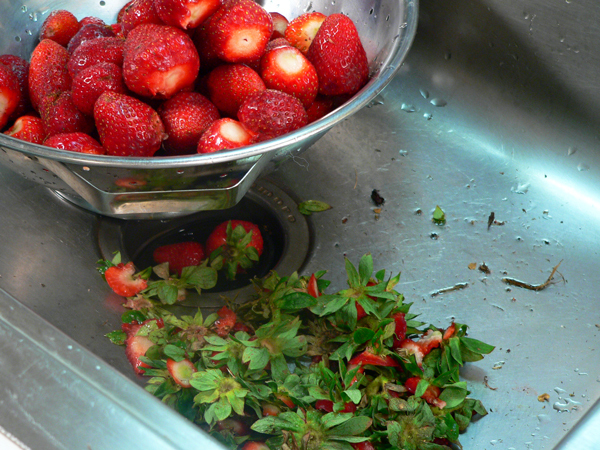 Throw all the hulls away, rinse the sink and dump the trimmed berries back into the sink. We need to wash them next. 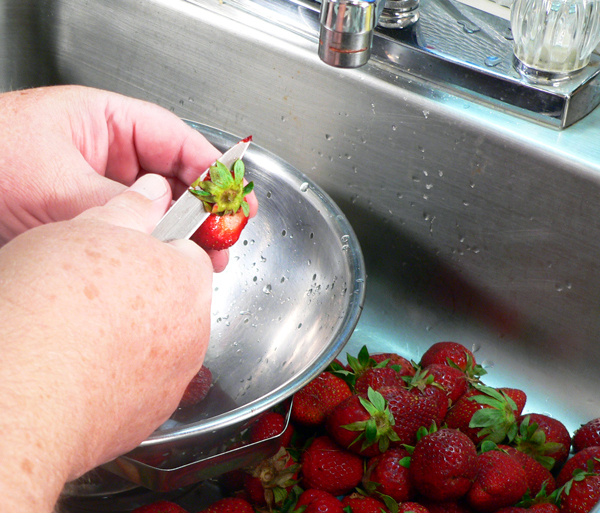 You don’t want to just fill the sink with water and soak the Strawberries as you wash them. 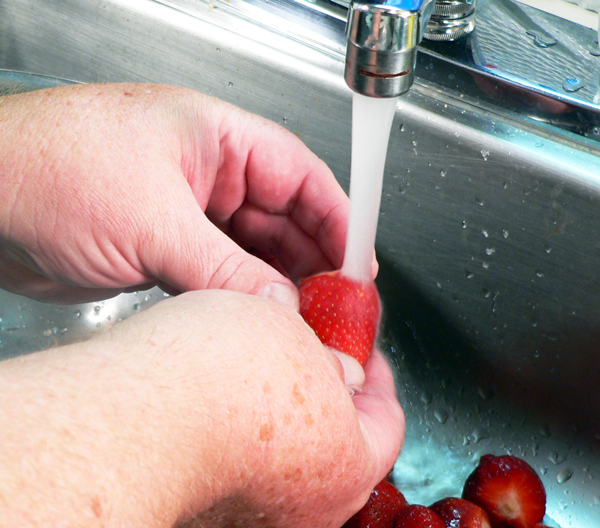 Instead, I just let the water run a little and wash each individual berry by hand, one at a time. It’s just the way I am. I want to be sure I get all the dirt out of the wrinkles and crevices on some of the berries and, to make sure I wash away all the little remaining pieces of stems or leaves. It really doesn’t take as long as you might think. As I wash each one, I place it back in the colander. When I’m finished, I give them all a final quick rinse and then just let them sit in the sink a few minutes to drain. Don’t they look all fresh and sparkly clean? Now, place the berries in a large bowl. You could certainly slice them up if that’s what you prefer. I decided to just leave them whole for this cobbler. I then sprinkled 1/4th cup of Sugar over the berries. If by chance your berries aren’t all that sweet, you could certainly add a bit more sugar at this point. It’s up to you. 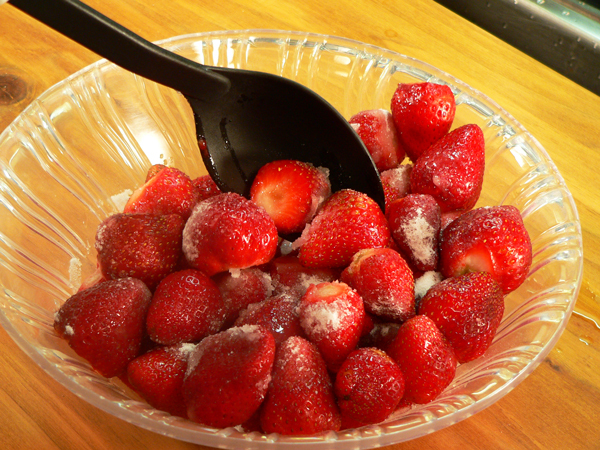 Use a large spoon and gently toss all the berries to coat them with the sugar. The sugar will start pulling the juice out of the berries. I’m using a 2 quart casserole – baking dish. As you’ll see, my berries filled it up. Make sure you use a deep enough dish or you’ll end up with one more big mess inside your oven as they bubble over during cooking. Grab about another Tablespoon of butter and rub it all over the inside of the dish. Coat it well, bottom and sides. 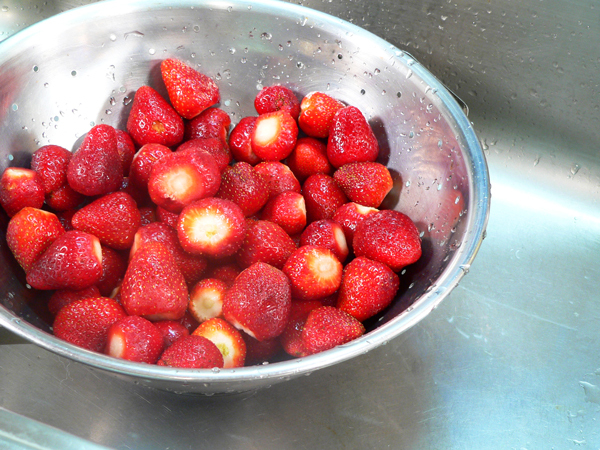 Add the sugar coated Strawberries to the baking dish. Just dump’em in and spread them around as evenly as possible. 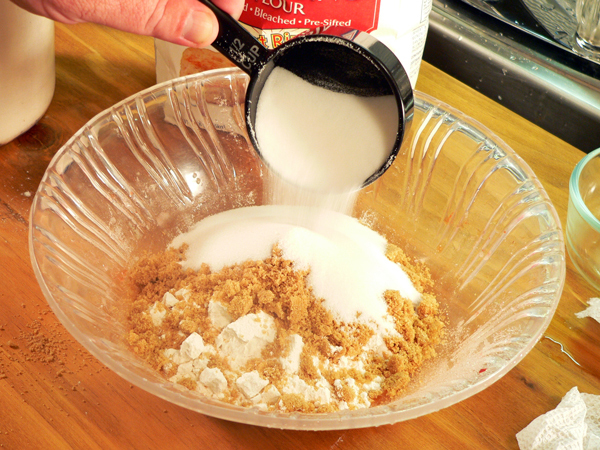 Add the remaining regular white Sugar. 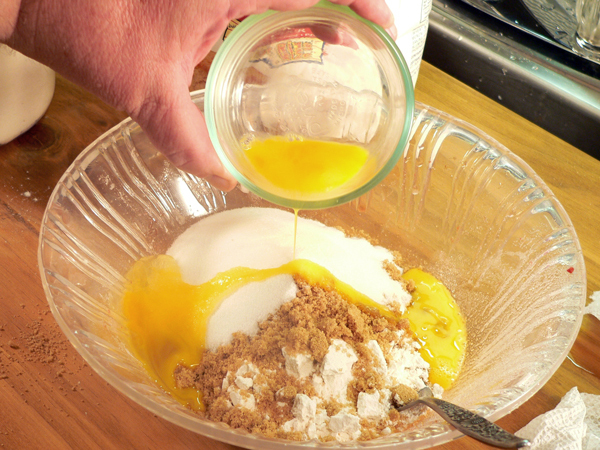 Slightly beat one egg and add it into the dry ingredients. Use a fork and stir all the ingredients together. It will form small lumps about the size of a pea but, that’s exactly what you want. 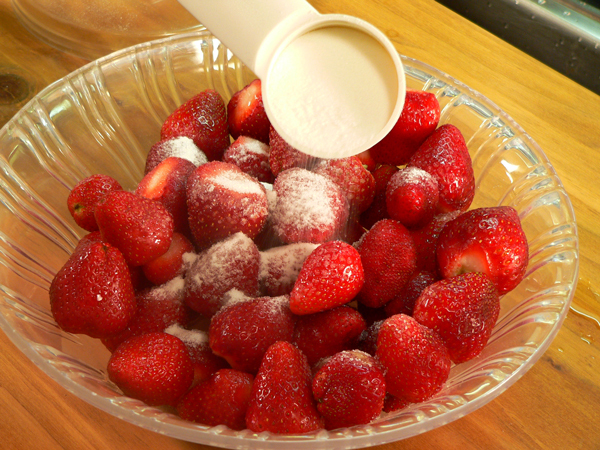 Pour this mixture over the top of your Strawberries. 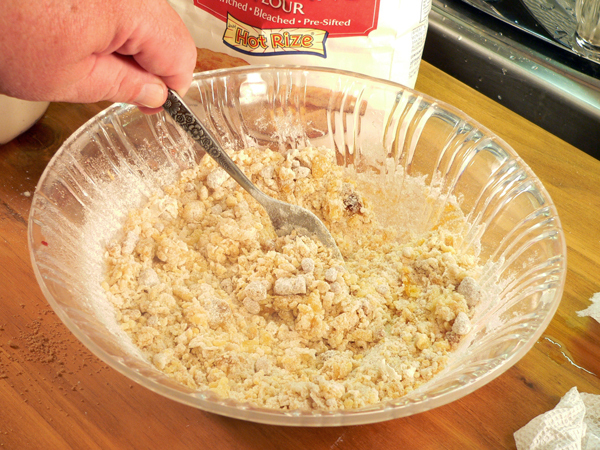 Use the fork to gently spread it out evenly over the top as much as possible. 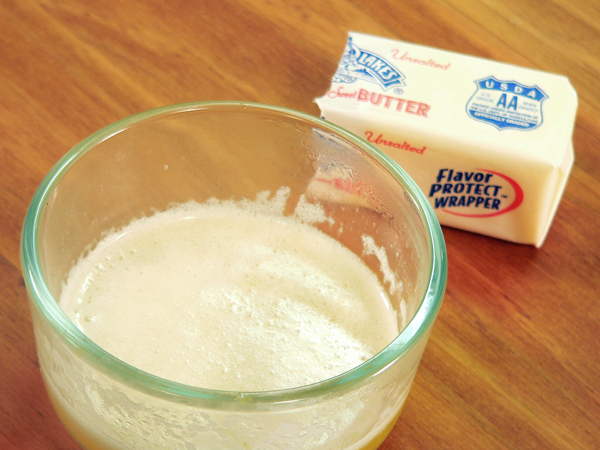 Melt the 1/2 stick of Butter. If you’re using the microwave, melt it slowly, about 10 seconds at a time to avoid making a big old mess. Drizzle the melted Butter over the topping. Bake at 350º for about 30 minutes, or until the topping is done and slightly brown. Don’t let it burn. Remove the cobbler from the oven and place on a towel or cooling rack and let it cool. You can’t tell from this picture but, this is straight out of the oven and the juice is still bubbling all around the edges. It gets HOT! You can serve this warm with a little Whipped Topping or maybe some Ice Cream. It’s also very good when allowed to cool and then refrigerate it for awhile to serve it cold. Either way, I hope you’ll give it a try and let me know how you like it. The topping is sweet within itself. You’ll probably find some of the berries to be sweet and some of them to be a bit tart. It’s that sweet and sour type of taste that makes it so good I think. I do hope you like it. 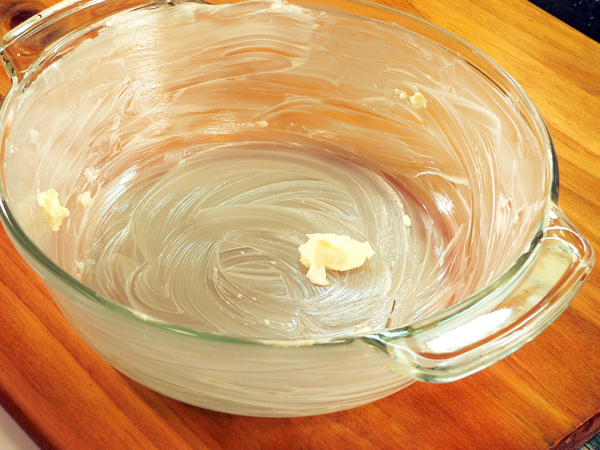 Generously Butter a 2 Quart Casserole-Baking Dish. 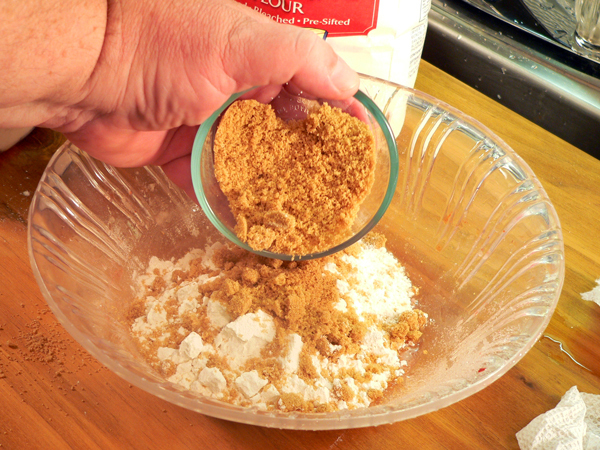 In another bowl, add Flour, Brown Sugar, remaining White Sugar and one sligtly beaten Egg. Your Comments: We hope you’re enjoying our recipes here on Taste of Southern. We’ve said it before, but its worth repeating, we don’t know you’ve stopped by unless you leave us a comment. We’ve got several more Strawberry Recipes coming in the days and weeks ahead and look forward to hearing your feedback on them. It only takes a minute or two, just scroll down and leave us a comment. Thank You in advance for visiting, I hope you’ll come back soon. I just got around to making this strawberry cobbler last night. It was absolutely fantastic. Our strawberry season here in Florida is gone, howerver, the ones I buy at Publix come from California and are pretty good. I used Splenda to sprinkle over the berries, but used real white and real brown for the topping because I knew Splenda would affect the texture. Thanks for the recipe and your newsletter. I’m glad you’re feeling better, and your friend, Jan, is improving also. This looks a keeper! Like the mixed berries idea posted – I look forward to your newsletters – and thank you for the smiles! Made a strawberry, blackberry, and raspberry cobbler this past weekend. Just the right amount of sweet and tart. Looks delicious! I always look forward to your blog and all of the old timey recipes you share. They are always ones I remember my Mother and Grandmothers made. Actually, that’s the way I cook too and am teaching my own daughter to carry on the traditions. Bless you and hope you are feeling better. Hi Cheryl, It’s great that you are passing your wisdom of cooking down to your daughter. It will be time well spent and great memories for you both in the days ahead. What’s your specialty item that everyone loves the most? I made this last week true to the recipe except for one thing – I by mistake put in a whole stick of butter instead of half (d-oh!). Upon hearing my mistake, my friend – from Texas – said, “Didn’t you know that you always double the butter in any recipe?” She was right – it was absolutely delicious. Southern wisdom or no, a recipe to keep for sure! Thank you! Made this recipe with some fresh strawberries a friend gave me. Turns out a few days later I was visiting a big peach farm in SC and they’d made strawberry cobbler from they said taste of southern recipe. A winner for sure. Thank you for this recipe! I have a strawberry bed that is outdoing itself this year. I am a Daughter of the South, but must admit these PNW strawberries are incredible. I didnt want to fool with a pie crust, and had never heard of strawberry cobbler. I added some chopped pecans to the topping. I might try some rhubarb in it next time, and in fact am looking forward to using this indulgent topping with all kinds of fruit. Thanks for something different, and for being just what I was looking for! I’m looking forward to exploring the rest of the site. Is there anyway to substitute egg with something else? I recently traveled to NC – ate at a restaurant in Charlotte that had strawberry cobbler, I have never eaten strawberry cobbler and loved it. I wanted to make one when I returned home and found your recipe that looked the closet to what I had at the restaurant I visited. Your recipe was absolutely wonderful. I was reading your post and noticed that you didn’t respond to the one asking why hers was so watery, did we do something wrong?, mine was a little juicy as well. So delicious! Made it a second time (double recipe) and added about a cup of blueberries I had in the fridge. Also added about 1/2 cup of toasted almond slivers to the topping. I love this recipe! Topping is crunchy and buttery. This recipe is perfect just as it is! I especially love the topping. I doubled the recipe for a casserole sized pan. I came upon this site when searching for a how-to on freezing strawberries in sugar, which I did find and thank you for that! Then at the bottom of the article I saw a link for this recipe and I just HAD to try it! It is cooling as I type, but it looks so delicious that I can hardly wait to try it! Yum! 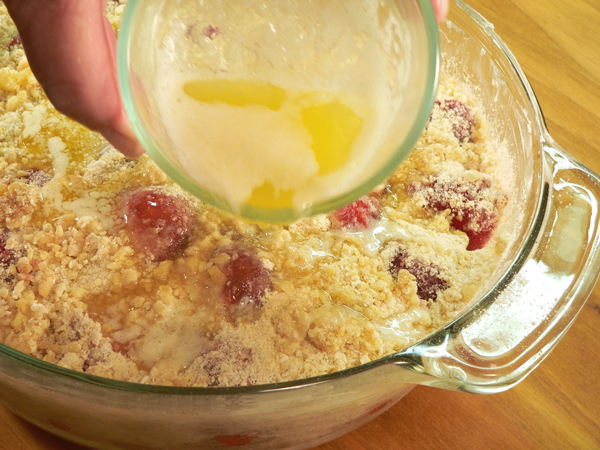 Thank you so much for this easy cobbler recipe! We have made this a couple times now and it is a huge hit with my family. We do it with a little different twist though. We will cook something on the grill, and when you get done you still have those really nice coals sitting there and it is a shame to let them go to waste, so we throw on this cobbler over indirect heat to cook while we are eating. About 1/2 hour later you have a great bubbly hot desert that everybody just raves over. I don’t know that it’s any better cooked on the grill, but I sure do enjoy cooking it that way. I don’t generally have self-rising flour on hand. Is there a way to make my own for this recipe? Thanks so much! This cobbler looks amazing. I am going to have to make it as soon as possible!! Thank you! I loved this recipe. We have been waiting for the summer blueberries to come in and with the rain and cold it has been slow this year. So we are making the most of strawberry season for now! I made this Memorial Day Weekend for a crowd of 16 and everyone loved it. We had small sweet strawberries from Baldwin County, Alabama. Such a nice change from strawberry shortcake. Thanks! Absolutely LOVED this recipe! And so easy too! I’m making it again and wanted to know if I did something wrong because it seemed more watery than I would have thought. But it did nothing to the flavor at all so if that’s to be expected because of the strawberries I’m ok with it. My husband ate all but one scoop that I was able to steal from the dish!! Thank goodness I have plenty more strawberries! Fabulous recipe!! Making this tonight and was wondering if I can make it ahead of time then bake it when we are ready to eat it? Or will it hold up for a few hours after cooled? 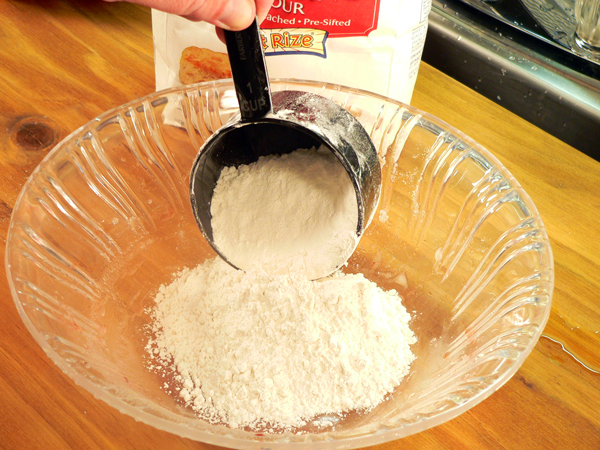 Can you substitute regular flour for the self-rising flour? This recipe is amazing! 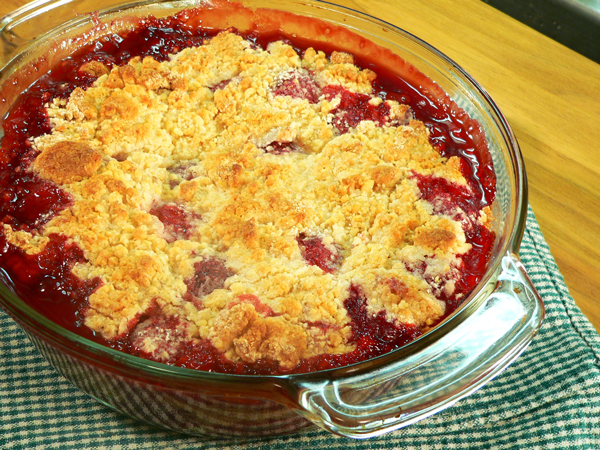 Me my brother and son went to a strawberry patch last year and i used this recipe to make a cobbler, it was a huge hit!!! Well here we are again headed to the strawberry patch this year, and i lost the recipe i spent an entire day looking for it and i’m beyond thankful i found it! I’m saving it to my desktop as we speak!! im excited about making this again, thank you for sharing this recipe with us!! I tried this for a small dinner party the other night. Oh my goodness was it a hit! We all loved it. Sooooo good. I added a little almond extract to the crumble topping, served the dish warm with vanilla ice cream and sprinkled toasted almond slices on top. Absolutely delicious. I was asked for the recipe. So, thank you very much. Hi Hiwi, Thank you for trying our Strawberry Cobbler recipe. I’m delighted to hear that it turned out well for you and that you and your friends enjoyed it so much. I do hope you shared the recipe. (Smile) Your description made me want cobbler. Hi Melissa, Greetings to the Philippines from North Carolina. Happy Birthday to your husband. I trust he has a great day and I wish him many, many more Blessed Birthdays yet to come. 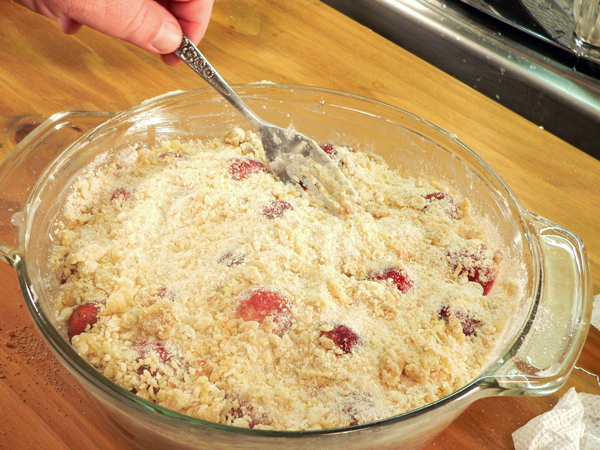 Have your recipe for Cobbler ready to go for cooking this afternoon. Have used up half the very good priced strawberries in Muffins for the freezer and was at a loss what to do with the rest of them. The Cobbler fits the bill exactly…and so easy. Yay! 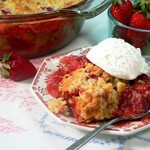 I googled strawberry cobbler and found a lot of recipes for strawberry cobbler. I have been making berry pies and cobblers for more years than I am willing to tell. I wanted something easy, quick and delish’. I made this this afternoon and let me tell you it is WONDERFUL! I will be trying this with peaches later this week. Thank’s for taking the guess work out of this for me. I can’t wait to share this with my family & friends. THANKS AGAIN!! Prepared this recipe over the weekend…all I can say is IT WAS WONDERFUL! My son, who by the way, is the biggest strawberry lover I know, couldn’t get enough! He has already asked me to make it again! Very easy to make and one of the BEST EVER strawberry desserts I’ve had! I’m so glad I found your beautiful website. Love the stories and especially all the photos of the preparation. Just wanted you to know that I made this cobbler last night and it is a big hit. Simple and easy. I’m making Mama Ruth’s strawberry cake next. Thanks again and get us some more strawberry recipes while they’re still available. Steve, this recipe looks delicious and very easy, so I will try it as soon as I get another bucket of strawberries. Keep the recipes coming as I have heard so many people say they love your site. Steve, I made the strawberry cobbler and it was AWESOME! My family really enjoyed it. Keep up the good work and keep those recipes coming!!! I can’t wait to try some more of them.